SRSLY Dexter has enjoyed a year full of accomplishments and milestones, thanks to the tremendous support we receive from our community. SRSLY is 10 Years Strong this year, and we celebrated with donors, volunteers, and supporters at the historic Michigan Theater on August 15. Thank you to all who attended this landmark event! We continue to be grateful for — and amazed by —all of our volunteers! Since the coalition formed in 2013, 289 youth and adult volunteers have donated more than 1,900 hours. 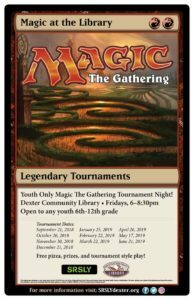 All of our efforts, including our free events and special projects for Dexter youth, would not be possible without you. Thank you! SRSLY distributed free CPTN SRSLY comic books to all Dexter students in grades 2-8. CPTN SRSLY is an original series that uses a medium that kids already enjoy — comic books — and communicates positive messages, including overcoming fear, resisting peer pressure, and using teamwork. SRSLY partnered with local businesses to prevent underage drinking with Project Sticker Shock. This project conveys a straightforward and powerful message about the dangers of supplying alcohol to minors. SRSLY youth gathered for a Youth Steering and Committee meeting to plan future events and strategies for SRSLY Dexter. Youth shared their ideas over pizza and enjoyed collaborating with their peers.